Joe Mannix is a key figure in the New York City songwriter underground, hosting monthly showcases; building a cult reputation with raves from the NY Times, Washington Times and media / airplay in the UK, Italy, Canada, Spain, Japan, France and more. Joe is constantly touring and garnering airplay, fans and a reputation as a formidable live act either solo or with his trio ("with melody and muscle...the band and their leader held court from the get go" Amplifier). A Town By The Sea is Joe's second solo album (there were also two acclaimed CDs with his roots rock band, Mannix). Recorded in an old dark church in Hamilton, Ontario, Canada, with the cream of that city's roots musicians - spearheaded by producers Glenn Marshall (a Daniel Lanois engineer) and Canadian roots pop icon Dave Rave (Teenage Head, The Shakers, and ex-Lanois studio guitarist). This trio co-wrote the song "Gambler's Blues." The result is a kind of sweet blend of Warren Zevon, Townes Van Zandt, Neal Young, Bruce Springsteen and David Gray; familiar and yet brand new at the same time, a comfortable warm wind of Americana blowin' down the cold winter streets of New York's East Village; like Phil Ochs fronting The Band in another place, another time. Joe Mannix (his real name) grew up in Northport, Long Island, spending hours with his older brother listening to the discarded jukebox singles from their parents' nightclub in the 70s. "I shared a room with my older brother who raised me on great folk and rock and roll of the 1970's." While in college in the 90s, Joe's punk pop outfit, Oral Groove "got great press and played the big NYC clubs like irving Plaza." 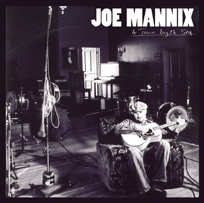 Joe's next project was the Mannix band, which toured non-stop and cemented his songwriting rep. Going solo has been very liberating; Joe now has the option of performing with his trio or going it alone. "I like the fact that I can do both. You have to really be on top of your game to perform a solo set and keep the crowd's attention in a club atmosphere. I enjoy the challenge. Creating music is why I dedicated my life to being a songwriter." Coming up through the New York scene, Joe shared bills with Grammy Award winners Norah Jones and Jesse Harris at the hip Living Room club. Lately, he's opened up for Joe Cocker, Jason Mraz, Hall & Oates, and one of his favorite bands of all time, Creedence Clearwater Revival. A Town By The Sea is a very personal statement; a mature work by an artist on his way. In the new song underground, Joe Mannix is a man on a mission. "Melancholy & wistfulness... a songwriter of lyrical vision & artistic verve..."
"A sweet folk-rock album...this is also one of the things that makes it stand out in our times of inane hubris"
"Joe Mannix imediately can be placed in a fine niche of performers such as Michael Penn and Neil Finn..."
"This is dark and deep Americana that shouldn't be missed... an exceptional talent to blend the accessibility of a gentle Pop style with the edgy and gutsy substance of Americana and folk..."
"There's a lot of Harry Nilson in the quirky lyrical choices, Dylan in the fullness of harmonica and guitar gustiness. The thing is, the heart of folk music is friendliness - that's folksiness. Mannix has that nailed, and it just makes you want to keep listening..."